This DigitalGlobe satellite image shows the 2014 Winter Olympics village in Sochi, Russia. This image was collected Jan. 2, 2014. Here's a view of the Olympics only the astronauts can get. 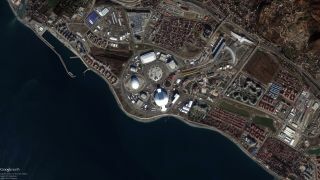 New satellite imagery shows the sprawling sporting venues and slopes that will host the world's best athletes next week when the 2014 Winter Olympic Games in Sochi, Russia begin. This DigitalGlobe satellite image shows the 2014 Winter Olympics event slopes in Sochi, Russia. This image was collected Jan. 2, 2014. Sochi boasts several newly built arenas to accommodate sports from speed skating to ice hockey to curling, while resorts miles outside of the city are now prepared to host Alpine skiing contests and the bobsled, luge and skeleton events. Watchdog groups have estimated that Russia has spent nearly $50 billion on the Olympics, making them the most expensive Games yet. President Vladimir Putin, however, recently claimed that Russia only spent about $7 billion to host the highly anticipated event, according to The New York Times. This DigitalGlobe satellite image shows Sochi, Russia, home of the 2014 Winter Olympic Games, as it appeared from space on March 17, 2013. In November, amid the epic relay of the Olympic flame, two Russian cosmonauts took the Olympic torch on a spacewalk outside of the International Space Station for a historic photo op. The torch was returned to Earth in November soon after the spacewalk in a Russian Soyuz capsule that landed on the steppes of Kazakhstan with two NASA astronauts and a cosmonaut who spent five months in space. DigitalGlobe's fleet of Earth-watching satellites have been able to snap some timely images, including a photo of the Costa Concordia cruise liner from space, showing the shipwreck on its side; the likely compound where Osama bin Laden was shot and killed; and even treasure-hunter's looting holes that were carved into Syria's archaeological sites amid the country's civil war.